Ever wondered how product placement works in TV and film? Especially if it’s set way back when. Los Angeles-based Michael Nusinow has been advising on-screen Coca-Cola product placement for 25 years – get a glimpse behind the scenes. Michael Nusinow is sifting through a crate of glass Coca-Cola bottles, row by row, when he grabs one that catches his eye. “Our period bottles from the 1940s and ‘50s are embossed like this one,” he says, tracing the logo’s raised lettering with his finger. 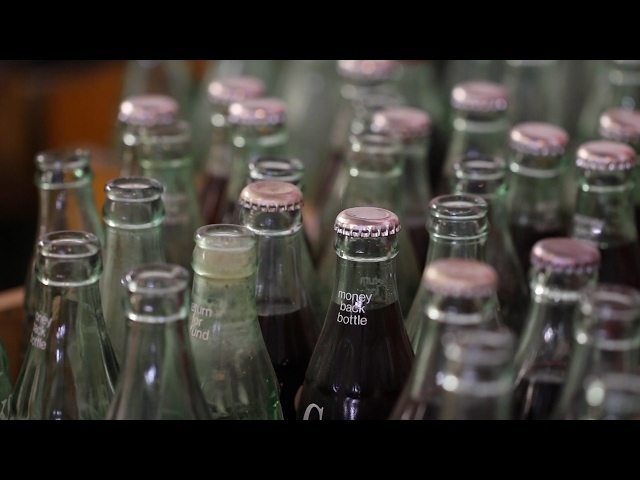 A few years ago, Nusinow bought several hundred of the vintage vessels from a Coca-Cola bottler in Kentucky. But unlike thousands of avid collectors around the world, he doesn't acquire Coke memorabilia as a hobby. For nearly 25 years, his company, Premier Entertainment, has worked with The Coca-Cola Company to “place” its products, signage, equipment and more in movies, television, music videos – and, as of recently, on-demand streaming series on platforms like Netflix. Coke’s supporting role in the movies dates back to the early-1900s. In the ‘50s, the company set up an office in L.A. to be closer to the entertainment capital of the world and get its beverages on set and on screen. Premier Entertainment took over these responsibilities in the ‘90s, and has worked closely with Coke's L.A.-based entertainment marketing team and Atlanta-based archives since then to field requests from studios, networks and showrunners. “They're our front lines with producers, studios... anyone with a camera looking to integrate Coca-Cola brands into their content,” says Tara Piper, director of entertainment marketing, Coca-Cola North America. In many cases, Premier receives scripts that call for a Coca-Cola bottle, billboard or commercial from a specific year. Other times, a set designer or prop manager will send a more open-ended request. Nusinow often consults the Coca-Cola archives’ online database, which is loaded with hi-res image images, video clips and other visual assets. “I can research wall signs or ads from a specific year, download the artwork, and send it to have it reproduced,” he says, adding that he also occasionally buys items on eBay. “We have so many things at our fingertips that can make scenes look realistic and add colour and context to the time and place they're trying to recreate,” Nusinow said. Premier's warehouse includes wooden crates of vintage Coca-Cola glass bottles, diner menu boards and much more. The warehouse Nusinow mentions is located at the back of a relatively nondescript office building in North Hollywood that, from the curb, offers few hints at the throwback treasures behind its doors. The space is stacked with Coca-Cola bottles, cups and cans, signs, and other artifacts available to the Hollywood community. Branded clocks, posters and menu boards hang on the walls alongside framed photos of Coke cameos in blockbuster hits and indie favourites over the last two decades. A conference room is decorated with promotional bottles and Olympic souvenirs, and vending machines and coolers line the hallways. Every item is ready for its 15 minutes – or 15 seconds – of fame. The industrial-style building is also home to cases of Coca-Cola beverages (the company does not pay to place its brands on screen, but often helps offset studio catering costs by providing casts and crews with drinks to enjoy during production). All loaned items are returned to Premier after filming. Piper and Premier take careful steps to ensure Coca-Cola brands are portrayed favourably and in the proper context – no violent or graphic content. “We’re very specific about how our products must be used,” Piper says. Each “role” must “be aligned with our brand values and where we are going strategically as a company,” she adds. And as Coke’s product portfolio has expanded over the years, so too has its screen credits. “When you see an actor in a movie or on TV walking around with a smartwater or an Honest Tea, it's because that's probably what he or she is walking around with each day,” Ryan explains. Vending machines and a Coca-Cola director's chair inside Premier Entertainment's Hollywood warehouse.